The entire Final Fantasy XIII saga is a tale about cheating fate, about recognizing one’s own mortal frailty and acknowledging that even one person standing alone capable of bringing about change. 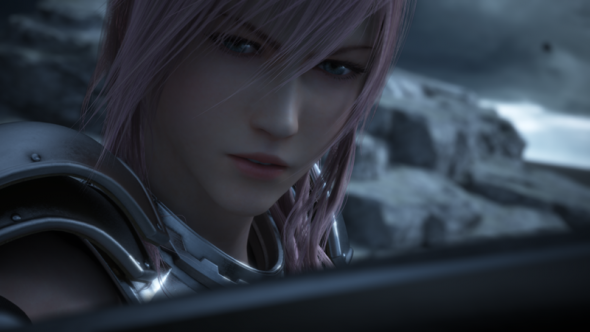 In XIII-2, Serah Farron sets to out save her older sister Lightning, who has been wiped from history and memory. She has been pulled from the present to serve as a knight to the Goddess of Death in the distant future. Accompanied only by the last surviving human, a man named Noel from the end of time, Serah must unravel the messages in her prophetic visions and fight a mysterious man named Caius while preventing humanity’s demise and ultimately the collapse of the universe. Final Fantasy XIII was linear. XIII-2 is the extreme opposite, offering so much opportunity for exploration it’s dizzying. Navigating the Historia Crux, the game’s time-travelling system, is admittedly daunting at first. Certain areas become available upon completion of certain quests in others. The game will often suggest which time period you should warp too next by leaving its gate in the center of the screen, but players can choose to visit another or re-visit a previous era. The excellent thing about this is that you can rewind time in areas you’ve already beaten, essentially allowing you to start the area over but keep the treasures you’ve already plundered from it. Gates are opened by items called artefacts, which are sprinkled throughout the worlds and usually obtained through fetch quests, puzzles, or viewing certain scenes. The straight corridors are gone, and while the game does point to the next place you should be headed on its maps, there is far more than one way to get there. Some environments are revisited in different time periods, and in each instance the area changes. There are new treasure chests and new creatures, and sometimes a dramatically different climate. The people you meet may be the same NPC model pasted over and over with differently-colored clothing, but no two people will offer the same information or ask for the same thing. Square Enix has taken the barren, empty shell of a world of Final Fantasy XIII and replaced it with one teeming with people — living, breathing, feeling people. It is clear the game’s goal is to present a portrait of humanity over time — from its formative years to its destruction. The sobering idea of human frailty and mortality hangs over everything, and none feel it more acutely than hero Noel Kreiss. A few words about Noel. 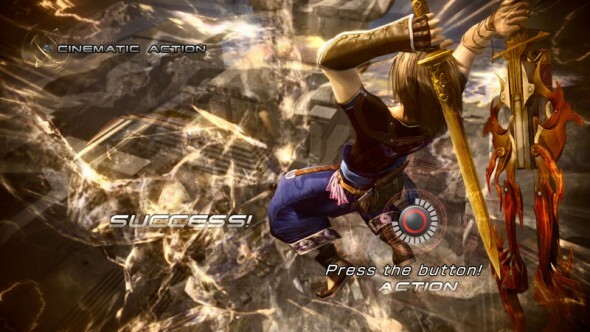 On the surface Noel is a hard-worker, proud, and determined to guide Serah to Lightning. But as the story moves along, Noel’s inner demons creep out — and we learn that he is lonelier than we think, sadder than we think, and hiding a deep and sordid history involving a handful of other characters. One of the more refreshing aspects of XIII was its character-driven story. However, in an attempt to craft a complex plot packed with intricate connections and grand pronouns, most of the story’s heart was lost and little explanation was given for many of its overarching concepts. XIII-2, for all intents and purposes, has two main heroes: Serah and Noel. While players watch the sheepish, optimistic younger Farron sister grow into a thoughtful and brave young woman, it is the girl’s gentle acceptance and support of Noel that allows his tale to unfold before our very eyes. There is nothing convoluted in their stories, and there is something pure about the way Noel assumes his burdens and swears to rectify the paradoxes in the time line — even if it results in him ceasing to exist. That being said, Noel is an excellent addition to the cast of XIII‘s world. While its predecessor’s battle and development systems were a little clunky, XIII-2 has streamlined everything, making for a smoother experience in developing characters and executing attacks. Paradigms no longer run an animation when you change them, making for quicker execution during crucial moments when switching is a matter of life and death. The death of the party leader no longer means defeat of the party — should the player-controlled character die, control will automatically switch to the other. Cinematic Action sequences with Live Trigger commands create a sense of urgency — repeatedly pressing X to Auto-Chain just doesn’t cut it anymore. Correctly entering Cinematic Action commands will reward you with some truly impressive action sequences as well as a couple hundred, or thousand, extra damage points. The monster recruiting system is pretty intuitive. Tamed monsters already have an established paradigm role when caught and can be advanced along the Crystarium using special items that be found wild or purchased. You can even dress your monsters with silly decorations, such as newsboy caps, tattoos, and flowers. There is also a name bank that suggests a score of names to further personalize your monsters. During my playthrough I became significantly attached to Regulus, my Buccaboo Ravager. I even gave him a little Carbuncle doll to sit in that weird hole in his body. There is an endless number of things to do in this game. Bored with the section of story you’re in? Go train in the Coliseum. Procrastinating on finding that artefact you need? Go kill some time racing Chocobos or playing slot machines at Serendipity, the game’s casino. Some time gates feature nothing but optional tasks, offering players nothing more than several paradox puzzles to hone their solving skills. 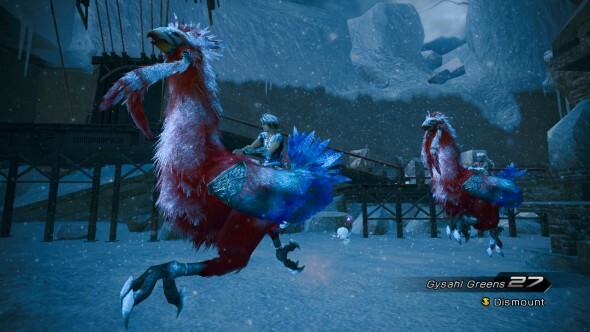 Environments are expansive and a real treat to look at, and you may want to jump on the back of a Chocobo (especially the crazy red and purple one) and take a scenic ride. There are treasure chests that can only be acquired using the Moogle Throw ability and can’t be found with just a cursory glance. And if you’re willing to hunt down the game’s 160 Fragments, you can take them to the Mystic in Serendipity and trade them up for some sweet ability upgrades. You may not agree, but I find the time-travelling merchant Chocolina entertaining, XIII-2‘s answer to X‘s O’aka. Chocolina runs the game’s one-stop shop and is available in multiple areas of each time period you visit. Chocolina’s frantic chatter as she panders her goods is a refreshing change from sifting through a dozen impersonal shops. She is ever-aware of her current environment and the state of the game — as you move through the final areas of the game, Chocolina will state how everyone is counting on Serah and Noel, and how she will miss talking to them once the gates close. In addition to more extraneous activities than you can shake a moogle’s bobble at, Square has introduced several new characters into the mix, including the above-mentioned protagonist Noel. Alyssa Zaidelle, Hope’s smart and snarky assistant, adds another dimension to the plot thread following Hope and the Academy. Yeul’s delicate presence on screen throws a sobering, somber blanket over all, and as her story unravels it only gets sadder. But perhaps the best addition to this cast of characters is Caius Ballad. Caius is not power hungry, nor is he truly evil at his core. He fights with a purpose, and as the player learns more about him the man morphs into a sympathetic figure. He is human, after all, a human who has taken on a terrible burden and is running with what he knows. His sorrow-driven plight is what solidifies the game’s story. 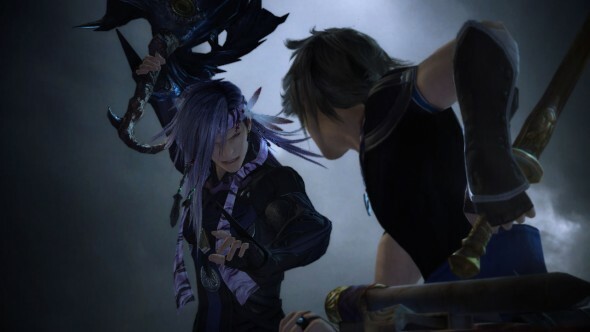 As far as Final Fantasy villains go, Caius is an excellent addition to the line-up, and his presentation from design to move set to voice acting is the shining gem in the game’s twisted plot. Fans of the cast of XIII will be sorely disappointed. For one thing, you barely see Lightning. She is featured more predominantly in the promotional material than she is the actual game. 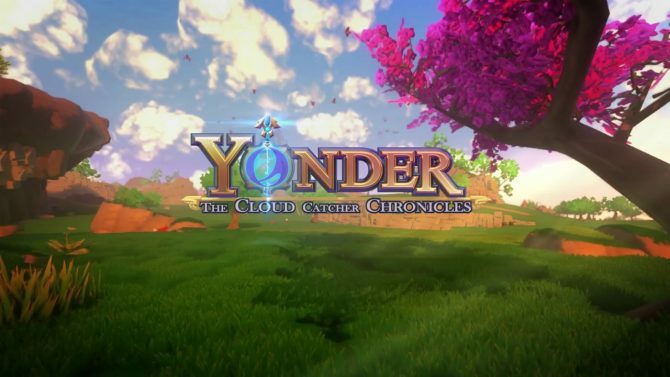 Returning for a few voice overs and present in a handful of CGI sequences and a cutscene, the older Farron sister is placed on the back burner in favor of her little sister. Serah, uninteresting and feeling rather out of place in the first game, really shines in the second. In the years since Cocoon’s fall she has matured, and the young lady sniping monsters in this game feels like a completely different character. Lightning isn’t the only XIII favorite to be sidelined. Snow is encountered briefly, and Sazh gets even less screen time. Hope becomes a key player in the madness, but despite whipping out his boomerang more than once, he never joins your party. 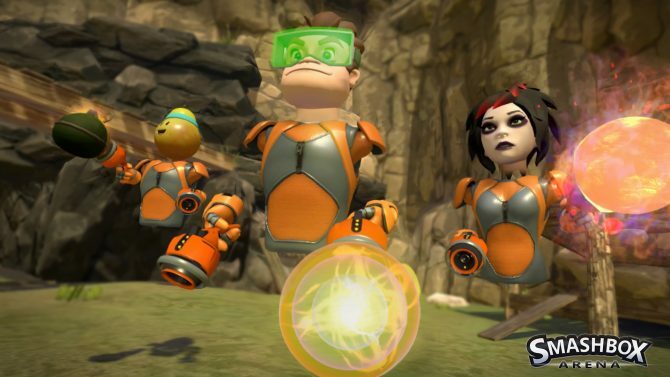 Without giving too much away, the main plot of the game is truly terrifying. Lightning is protecting a goddess — the goddess whose death means the end of harmony and the hostile takeover of the entropic entity known as Chaos. Serah and Noel trudge through the ruins of Paddra, a city of people who could see the future. Ghosts call out to Serah and Noel. Sometimes phasing in a human anomaly with Mog’s ability results in them dying instantly, right before your eyes. There is a creature who in the future weakens the crystal pillar holding up Cocoon and eventually brings it down, destroying Fang and Vanille in their crystal stasis. You hear mentions of the goddess on multiple occasions — but the goddess is absent, and the weight of fixing all of space and time falls on the shoulders of Serah and Noel. It’s all very real, sinister, and harrowing. 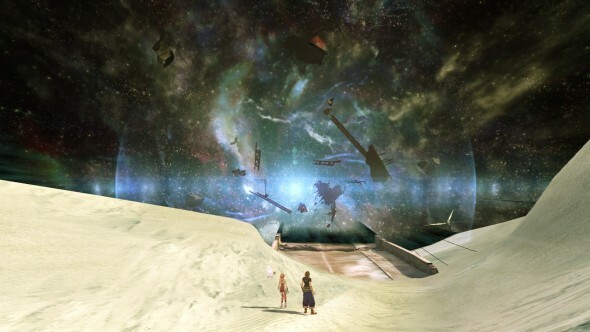 However, XIII-2 suffers from the same problem at XIII — a lot of the information you need, as well as tidbits of story that offer welcome supplements to gameplay, is found only in the datalogs. Diaries from Snow, Mog, and a handful of other characters as well as recorded prophecies and slices of Pulse’s history lie buried in the Fragments. Much of the answers the player needs to understand the game are again removed from actual gameplay and regulated to the menu. 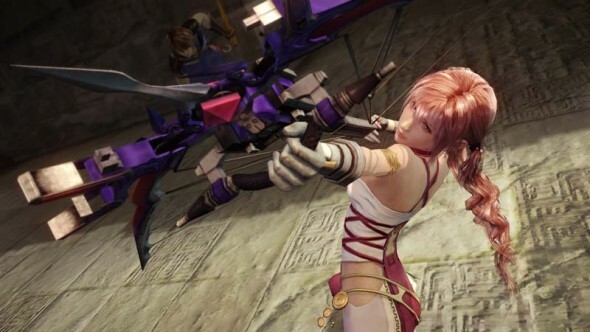 Whereas the adventure of Lightning and company was linear to a T, the story of Serah and Noel requires a significant amount of stop-and-think moments. It’s difficult to keep track of where you’ve been and where you should be going next, or which version of what person you’re speaking to in this time period. 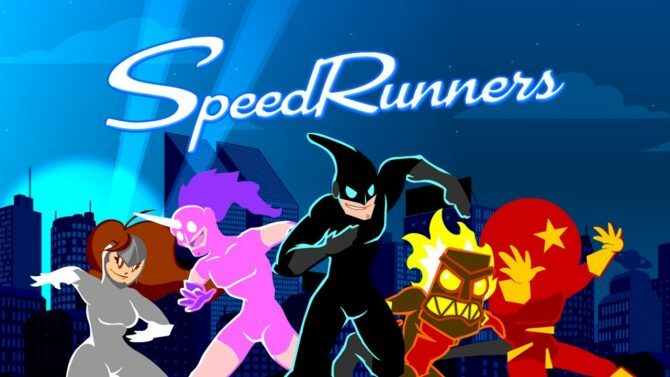 Some time jumps are made without explanation, and select characters find their way 500 years into the future with truly lame explanations and plot devices. 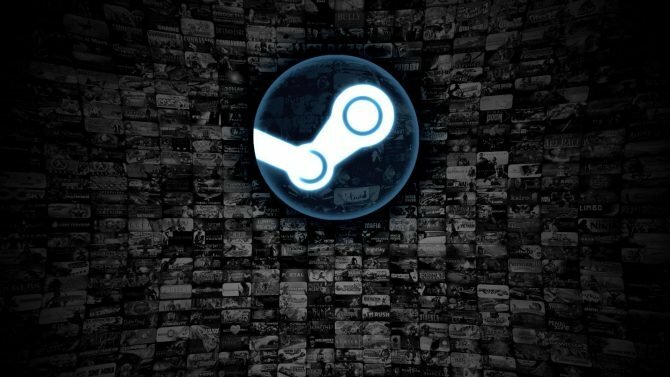 It requires a lot of patience to sift through certain chains of events, and especially confusing when returning to the game a second time to obtain paradox endings. In the long run the time travel idea worked, but could have been tighter. Final Fantasy XIII-2 demonstrates to fans that yes, Square Enix was listening to complains about XIII. While some things could still use a bit of tweaking, others such as monster recruitment are a welcome addition to the fray. What XIII lacked in heightened emotional moments its sequel more than makes up for, painting a picture of a world that is constantly in flux between hope and despair, prosperity and annihilation. With relatable characters and an antagonist worthy of the coveted final battle slot, it’s hard not to care. Sporting major improves with minor difficulties in execution, XIII-2 improves in almost every way on its forerunner.